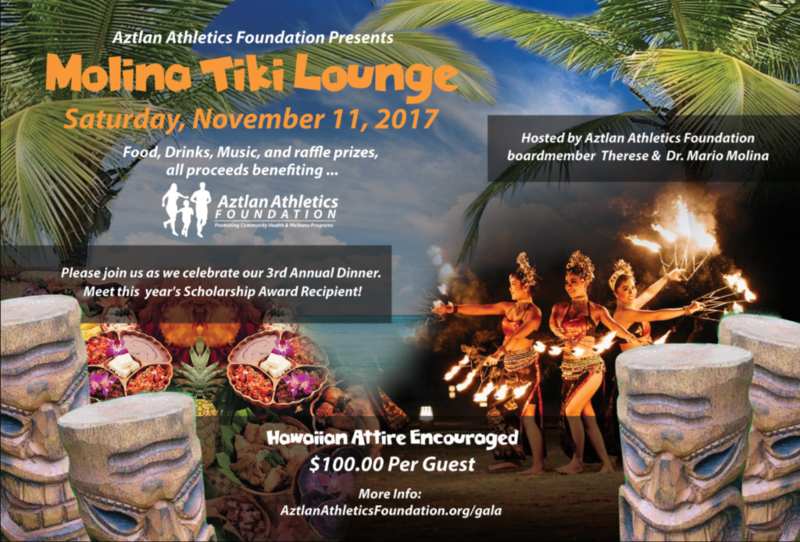 Please join Aztlan Athletics Foundation at our 3rd Annual Dinner on November 11th, 2017 6:00 PM. We wish to honor and thank those who have supported us with a night of great food, company, and a night of entertainment. We will also be awarding two scholarships for youth who have displayed athletic and academic excellence over the years. All event proceeds will help support Aztlan Athletics Foundation efforts with it’s partnering non-profit organizations in developing sustainable and affordable health and wellness events while providing subsidized costs for youth. $100 dinner donation includes appetizers, dinner, and 5 tickets for drinks and/or raffle prizes. Purchase your raffle/drink tickets ahead of time.Tickets will be on sale for $5 on day of Luau and can be redeemed for drinks or participation in the raffle prizes.